As a techno expert, The Video calling is one of the best things I love to do every day with my family, friends, and relatives. It provides me the movement that they are near to me. It may be frustrating and complicated with video calling because of the app you are using. Have you tried the Video calling app Google Duo, one of the best most downloaded apps in a short period of time? If then try this you will never find complexity using it. Google Duo is a one to one video calling app available for Android as well as iOS users. It is Just like the Facetime IOS app but the Google Duo is more advanced than that. Using Google Duo you can call to android or ios platform users but with face time you can only call to the iPhone users. The video calling app, Google Duo is user-friendly. There is no need of separate account for start up. You just need the phone number. After verifying your number you will find the Google Duo users from the contact list. You can instantly call with the users with a single tab. Here are some of the features that will help you enough about the app. The app is totally user-friendly. With a simple setup, you can use the app easily. 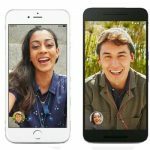 The Google Duo supports video calling across Android and iOS. So with a simple tab, you can enjoy calling video with your family, friends, and relatives. One of the common problems of the online apps is that they take a time to reconnect once they disconnect But Duo stands quite opposite than this. The Google team had made the app Fast and reliable that the video call connect so quickly and works so good in the slow network too. When the bandwidth is limited (or slows than of the normal time) Duo reduces the resolution and keeps the communicating connected. The app automatically switches between the Cellular data and the wifi to keep you call going on smoothly. Knock Knock is the next advance feature of the app that you have never experience nor tried it other video calling apps. The app, let the users live video preview before the call starts. The world’s largest search company Google has launched the app Google Duo why not to connect with it and share your face with other friends.